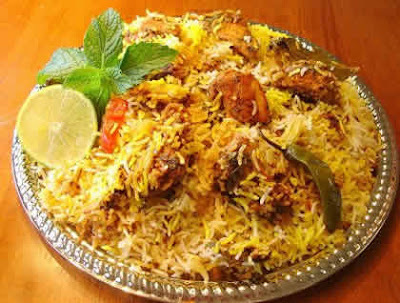 Discription:Biryani or Biriyani is a rice based dish made usually with basmati rice, aromatic spices and meat. It was brought to India by Persian merchants, travellers, and Mughal rulers. There are many popular variants of Biryani such as Awadhi or Lucknow Biryani, Hyderabadi Biryani, Lahori Biryani and Kerala Biryani - each one of them is influenced by the local style of cooking. Hyderabadi Biryani is a popular dish from Hyderabad in India. This delicious dish originated in the royal kitchens of Nizam, a Mughal ruler of Hyderabad in the 18th century. This dish is influenced by Mughal as well as Telagana style of cooking. Goat meat or mutton is the natural choice for Hyderabadi Biryani recipe, but it can be substituted by other meats such as chicken or beef. Making Biryani is an art which has been trasferred from generations to generations. In many famous restaurants serving Hyderabadi Mutton Biryani, their recipe is a top secret. Here you will find instructions to make a delicious Biryani at home, with easy to follow steps. 500 gms Basmati Rice (pre-soaked in water for 1 hour). In a large bowl mix the mutton chunks with yoghurt, one tbsp garam masala, turmeric, garlic- ginger paste and salt. Marinate this mixture for at least 3-4 hours in refrigerator. Make a fine paste of red chilies and cashew nuts. Heat 3 tb.sp. of ghee and pour it on the red chili masala, fry it for 3 minutes and keep aside. Fry ¼ of the onion slices to golden brown and add the marinated mutton to it. Fry this mixture on medium flame till ghee separates. Then add 1½ cups of warm water to it and cook on a low flame till tender. Fry the remaining onion to golden brown and keep aside. Heat 1 tbsp ghee in a wok and immediately add Cardamoms, Cloves, Cinnamon sticks to it, fry for a while and add the pre-soaked rice to it. Fry the rice a little then add the fried green chilies masala and some salt to it. Add enough boiled water in wok and cook till the rice is half done. Drain any excess water and Sspread the rice on a plate. In a small bowl, mix 1 tbsp. garam masala , fried onion the chopped coriander leaves and mint leaves and keep this mixture aside. Take a heavy wok and add 3 tb.sp. ghee . Make a layer of rice at bottom and above that ¼ of the mutton. Sprinkle half of mixture of coriander leaves and 1 tb.sp. lime juice. Make such 2-3 layers of rice followed by a mutton mixture. Top layer should be of a rice . Sprinkle saffron milk on the top of it. Cover the wok tightly and cook on a low flame it for 20 to 30 minutes tll the rice is done. Garnish the Hydrabadi mutton biryani with boiled egg cuts, fried onions and serve it hot.